"I came to America because I was told it was about equality for all. But any average person I pass on the street can run in Saturday's race, and I can't. I took an oath as a soldier to serve and defend the country, but I can't run in the country's national championship? I don't understand how that is fair or equal treatment." - US Army Private Joseph Chirlee, who is banned from this weekend's USATF NCAA XC Champs because of a stupid USATF rule which says if you can't run for the US internationally you can't compete at any US Championship. Chirlee's coach, 3-time Olympic alternate Lisa Rainsberger, says things more bluntly: "He can take a bullet for us someday in Afghanistan, but he can't run with his American contemporaries?" Discuss Chirlee's situation here. 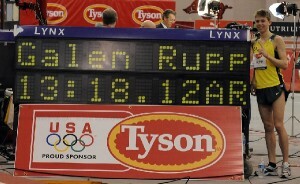 He's a 1:02 half marathoner and 2:12 marathoner. Alan Webb Is Back In - "North American Dream Mile Is On"
Lie to a high school runner or tell them the ugly truth? Dropped a casual jogger who wanted to run with me randomly, was this a rude move? LRC Preview Alan Webb Re-Enters New Balance Boston Indoor Games As "North American Dream Mile" Highlights Great Night Of Distance Action LetsRun.com has learned that Alan Webb is back in the race and, as a result, the highlight of NB Boston will almost certainly be a dream mile of nearly all the top North American-based milers, including Webb, Nick Willis, Leo Manzano and the high school phenom Lukas Verzbicas. Distance fans will go bonkers all night long, as the event features a strong women's 800 with Phoebe Wright, Morgan Uceny and Maggie Vessey, a great women's 3k with Kalkedan Gezahegne battling Jenny Simpson, plus a men's 3k with Mo Farah, Dejene Gebremeskel and Sam Chelanga, and high school miles. 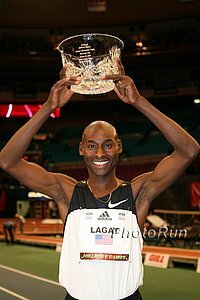 LRC Preview Bernard Lagat To Go For US Two-Mile Record On February 12th At The Armory It's worth noting that Doug Padilla didn't even know he still had the record (8:15.02). It's also worth noting that Robby Andrews is expected to rabbit - so it looks like he's rebounding from his plantar injury. Shalane Flangan And Matt Tegenkamp Headline US Cross Champs In San Diego On Saturday We're glad to see strong fields assembled in the last year before World XC takes a year hiatus. The US women got a bronze last year at Worlds and teammates Shalane Flanagan and Lisa Koll headline the women's race, and supposedly Kara Goucher as well. On the men's side, sub-13:00 guy Matt Tegenkamp headlines, but Abdi Abdirahman sounds very fit (4 x 3,000 in 8:30 on hills), plus Jorge Torres, Scott Bauhs and more. Ridiculous: NYT: US Citizen And Soldier Joseph Chirlee Barred From US XC Champs We say let him compete. It's the US Champs and he's a citizen. We can see keeping someone out of the Olympic Trials if they can't go to the Olympics, but that's about it. Stellar Half Marathon Sunday In Marugame Japan: Elvan Abeylegesse (1:07:07) Vs. Kayoko Fukushi (1:07:26) Vs. Nikki Chapple (1:08:37) Fukushi ran sub-31 for 10k 8 years ago as a 20-year-old, but has not gotten faster. Abubaker Kaki Was Trapped In Rioting In Egypt For A Few Days He couldn't leave the training facility in Cairo due to looters.